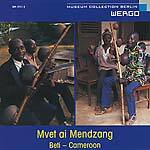 Part of Wergo's "Echos of World Culture" series (previous volumes were Global Accordion &Echos of Africa). "Europe is not one sound but many. Patchwork Europe presents the traditional music of the old continent in all its diversity: from Ireland to Mallorca, from Sicily to Norway and from Portugal to Russia. From these 26 rare, historic pieces, recorded between 1911 and 1954, a tremendous polyphony unfolds -- a wonderful musical patchwork of styles and traditions."